AUGUSTA, Ga. — If this were 1997 or 2001 or 2002 and Tiger Woods had the kind of round he had on Thursday, the only remaining question about the Masters would be his margin of victory. Fact is, he did have exactly the same score, a 70, in the first round of those years and won by 12, two and three strokes, respectively. Woods certainly can earn another green jacket this year, as he last did in 2005, when he began with a 2-over-par 74. He is playing well enough and is generating enough positive energy all over Augusta National Golf Club. But he will have a whole lot more competition than he used to face. Shortly after he left the course, one stroke out of the lead, golfers of all shapes, sizes and nationalities moved ahead of him. By the end of the day, he was in a 10-way tie for 11th, trailing by four. Woods is the only current golfer who meets Player’s rigorous requirement: “I think you’ve got to win six majors to be a superstar.” So, Woods, with 14, is a superstar more than twice over. And many of the other golfers in the field these days are as good as they are because Woods inspired them. That’s the rub. There are just so many of them. Whether or not professional golf is as good as it ever was, it surely is deeper. 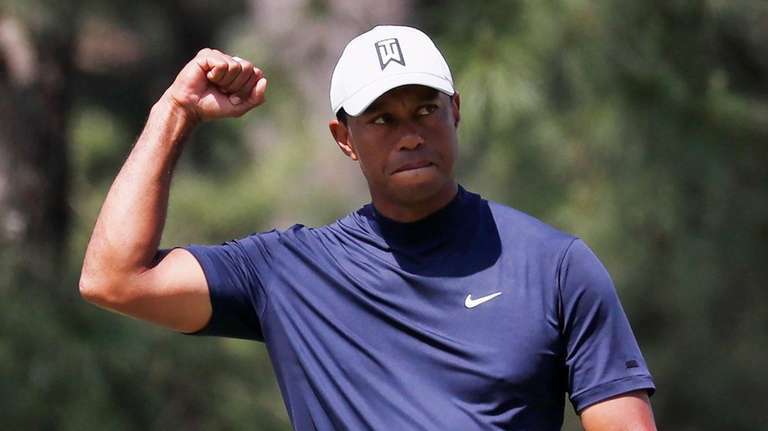 It is going to take a solid Friday and a heck of a weekend for Woods to win his first major in 11 years, his first Masters in 14. “I feel very good. I feel like I played well today and I controlled my golf ball all day. I’ve shot this number [or worse] and won four coats, so hopefully I can do it again,” Woods said. If he watched on TV after he returned to his rental home, he saw Brooks Koepka, who edged him for the PGA Championship last August, and Bryson DeChambeau make birdies right and left. He saw Phil Mickelson, also arguably a superstar with his five majors, come within inches of a hole-in-one on the par-3 16th. At least he is in much better shape than Rory McIlroy, the golfer who is flirting with history. A win this week would put McIlroy in a heady class with Woods, Player, Jack Nicklaus, Ben Hogan and Gene Sarazen as the only ones ever to complete the modern career Grand Slam. That would cement his place as a superstar. But the chase represents a ton of pressure, sort of like a batter who needs a home run to finish hitting for the cycle. “I think if I were in Rory’s position, I would be looking at trying to win the Masters, not trying to finish a Grand Slam. That’s enough to worry about,” said Nicklaus, who joined Player in the honorary starter ceremony hours before McIlroy shot 73, in a tie for 44th. The Masters leaderboardFollow each round and add players to your watch list with our 2019 Masters leaderboard.